Today is the birthday (1913) of Peter Wilton Cushing OBE, an English actor known to successive generations for roles in the Hammer Productions horror films of the 1950s, ’60s, and ’70s, as well as his performance as Grand Moff Tarkin in Star Wars in 1977. In the latter, he was by far the best known of the cast at the time, and the highest paid (based on weekly rates). His acting career included appearances in more than 100 films, as well as many television, stage and radio roles. Cushing was born in Kenley in Surrey and made his stage debut in 1935 after a completely undistinguished time in school in various places. He spent three years with repertory theater in London before moving to Hollywood to pursue a film career. Cushing made his motion picture debut in the 1939 film The Man in the Iron Mask, in a minor role, although he was originally hired as a stand-in for scenes that featured both characters played by Louis Hayward, who had the dual lead roles of King Louis XIV and Philippe of Gascony. Cushing would play one part against Hayward in one scene, then the opposite part in another, and ultimately the scenes were spliced together in a split screen process that featured Hayward in both parts and left Cushing’s work cut from the film altogether. Although the job meant Cushing received no actual screen time for those roles, he was eventually cast in a bit part as the king’s messenger. Cushing began to find modest success in films in the U.S. before returning to England at the outbreak of the Second World War. Despite performing in a string of roles, including one as Osric in Laurence Olivier’s film adaptation of Hamlet (1948), Cushing struggled to find work during this period and began to consider himself a failure. His career was revitalized once he started to work in live television plays, and he soon became one of the most recognizable faces in British television. He earned particular acclaim for his lead performance in a 1954 adaptation of George Orwell’s Nineteen Eighty-Four. 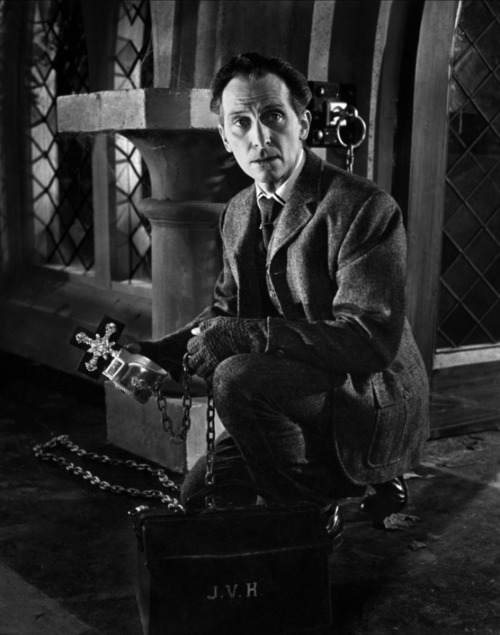 Cushing gained worldwide fame for his appearances in twenty-two horror films by the independent Hammer Productions, particularly for his role as Baron Frankenstein in six of their seven Frankenstein films, and Doctor Van Helsing in five Dracula films (by minor coincidence, today is the anniversary of the publication of Bram Stoker’s Dracula — http://www.bookofdaystales.com/bram-stokers-dracula/ ). Cushing often appeared alongside actor Christopher Lee, who became one of his closest friends, and occasionally with the U.S. horror star Vincent Price. 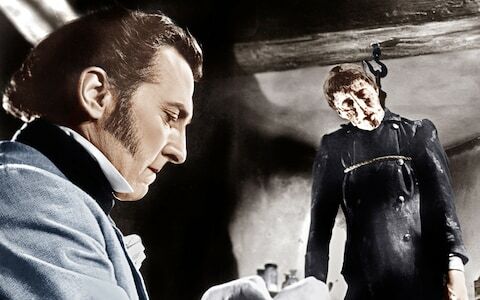 Cushing appeared in several other Hammer films, including The Abominable Snowman, The Mummy and The Hound of the Baskervilles, the last of which marked the first of many times he portrayed Sherlock Holmes throughout his career. Cushing continued to perform a variety of roles, although he was often typecast as a horror film actor. He played Dr. Who in Dr. Who and the Daleks (1965) and Daleks – Invasion Earth: 2150 A.D. (1966) when William Hartnell, the original Dr Who for the television series was unavailable. The physical resemblance between the two actors was useful, but the mannerisms onscreen of the two were markedly different. Both movies were eminently forgettable. Cushing probably gained the highest amount of visibility in his career in 1977, when he appeared as Grand Moff Tarkin in the first Star Wars film. Since the film’s primary antagonist Darth Vader wore a mask throughout the entire film and his face was never visible, George Lucas felt a strong human villain character was necessary. This led Lucas to write the character of Grand Moff Tarkin, a high-ranking Imperial governor and commander of the planet-destroying battlestation, the Death Star. 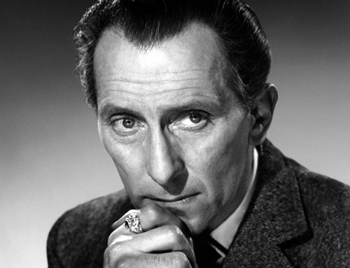 Lucas felt a talented actor was needed to play the role and said Peter Cushing was his first choice for the part. However, Cushing has claimed that Lucas originally approached him to play the Jedi Master Obi-Wan Kenobi, and only decided to cast him as Tarkin instead after the two met each other. Cushing said he would have preferred to play Kenobi rather than Tarkin, but could not have done so because he was to be filming other movie roles when Star Wars was shooting, and Tarkin’s scenes took less time to film than those of the larger Kenobi role. Although not a particular fan of science fiction, Cushing accepted the part because he believed his fans would love Star Wars and enjoy seeing him in the role. Cushing joined the cast in May 1976, and his scenes were filmed at Elstree Studios in Borehamwood. Along with Alec Guinness, who was ultimately cast as Kenobi, Cushing was among the most famous actors at the time to appear in Star Wars, as the rest of the cast was still relatively unknown. As a result, Cushing was paid a larger daily salary than most of his fellow cast, earning £2,000 per day compared to weekly salaries of $1,000 for Mark Hamill, $850 for Carrie Fisher and $750 for Harrison Ford. Like Guinness, Cushing had difficulty with some of the technical jargon in his dialogue, and claimed he did not understand all of the words he was speaking. Cushing got along well with the entire cast, especially his old co-star David Prowse (who played Darth Vader) and Fisher, who was appearing in her first major role. The scene in which Tarkin and Princess Leia appear together on the Death Star, just before the destruction of the planet Alderaan, was the first scene with major dialogue that Fisher filmed for Star Wars. Cushing consciously attempted to define their characters as opposite representations of good and evil, and he purposely stood in the shadows so the light would shine on Fisher’s face. Fisher said she liked Cushing so much that it was difficult to act as though she hated Tarkin, and she had to substitute somebody else in her mind to muster the feelings. 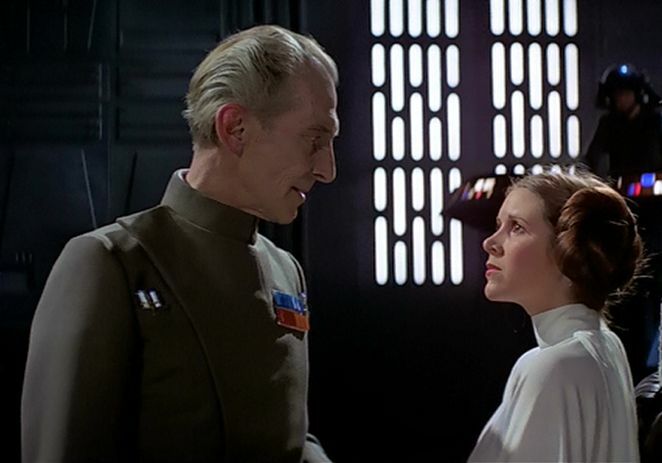 Although one of her lines referred to Tarkin’s “foul stench,” she said he actually smelled like “linen and lavender,” something Cushing attributed to his tendency to wash and brush his teeth thoroughly before filming because of his self-consciousness about bad breath. When Star Wars was first released in 1977, most preliminary advertisements touted Cushing’s Tarkin as the primary antagonist of the film, not Vader. Cushing was extremely pleased with the final film, and he claimed his only disappointment was that Tarkin was killed and could not appear in the subsequent sequels. The film gave Cushing the highest visibility of his entire career, and helped inspire younger audiences to watch his older films. 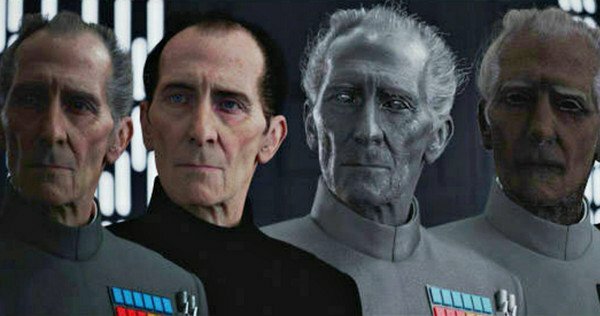 For the 2016 film Rogue One, CGI and digitally-repurposed-archive footage were used to insert Cushing’s likeness from the original movie over the face of actor Guy Henry. Henry provided the on-set capture and voice work with the reference material augmented and mapped over his performance like a digital body-mask. Cushing’s estate owners were heavily involved with the creation which took place over twenty years after his death. This extensive use of CGI to “resurrect” an actor who had died decades ago created a great deal of controversy about the ethics of using a deceased actor’s likeness. Joyce Broughton, Cushing’s former secretary, had approved recreating Cushing in the film. After attending the London premiere, she was reportedly “taken aback” and “dazzled” with the effect of seeing Cushing on screen again. Cushing continued acting into his later years, and wrote two autobiographies. He was lovingly devoted to his wife of twenty-eight years, Helen Cushing, who died in 1971. Cushing himself died in 1994 due to prostate cancer. Dice the beetroot and finely slice the celery. In a large pan sauté the onion until just turning brown. 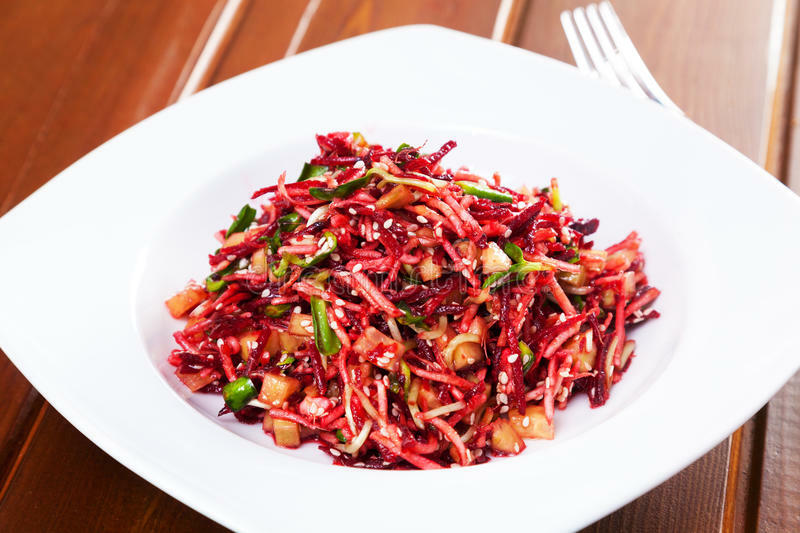 Add the beetroot and celery. Turn down the heat and cook for 2 minutes. Chop the potatoes into chunks and add to the pan. Season with pepper. Cover and cook on a very low heat until the potato is tender, stirring every few minutes to prevent sticking. 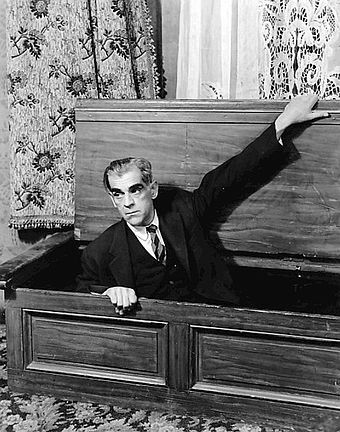 Today is the birthday (1887) of William Henry Pratt, better known by his stage name Boris Karloff. He was primarily known for his roles in horror films, but this time of year he is remembered as the narrator in the animated television special of Dr. Seuss’s How the Grinch Stole Christmas! (1966). Karloff was born in Camberwell in London, although he usually claimed that he was born in Dulwich, which is nearby in London. His parents were Edward John Pratt, Jr. and Eliza Sarah Millard. His brother, Sir John Thomas Pratt, was a British diplomat. His maternal great aunt was Anna Leonowens, whose tales about life in the royal court of Siam (now Thailand) were the basis of the musical The King and I. He was bow-legged, had a lisp, and stuttered as a young boy. He conquered his stutter, but not his lisp, which was noticeable throughout his career in the film industry. Karloff spent his childhood years in Enfield, in the County of Middlesex. He was the youngest of nine children, and following his mother’s death was brought up by his elder siblings. He received his early education at Enfield Grammar School, and later at Uppingham School and Merchant Taylors’ School. After this, he attended King’s College London where he took studies aimed at a career with the British Government’s Consular Service. However, in 1909, he left university without graduating and drifted around, leaving England for Canada, where he worked as a farm laborer and other itinerant jobs until he chanced upon acting. He began appearing in theatrical performances in Canada, and during this period he chose the performing name Boris Karloff. There are numerous speculations about the choice, but no one really knows why. The reason for the change is much simpler: he wanted to prevent embarrassment for his family. Whether or not his brothers (all dignified members of the British Foreign Service) actually considered young William the black sheep of the family for having become an actor, Karloff apparently worried they felt that way. He did not reunite with his family until he returned to Britain to make The Ghoul (1933), extremely worried that his siblings would disapprove of his new, macabre claim to world fame. Instead, his brothers jostled for position around him and happily posed for publicity photographs. Karloff joined the Jeanne Russell Company in 1911 and performed in towns like Kamloops, British Columbia, and Prince Albert, Saskatchewan. After the devastating tornado in Regina on 30 June 1912, Karloff and other performers helped with clean-up efforts. He later took a job as a railway baggage handler and joined the Harry St. Clair Co. that performed in Minot, North Dakota, for a year in an opera house above a hardware store. Whilst he was trying to establish his acting career, Karloff had to perform years of manual labor in Canada and the U.S. in order to make ends meet. He was left with back problems from which he suffered for the rest of his life. Because of his health, he did not enlist in World War I. 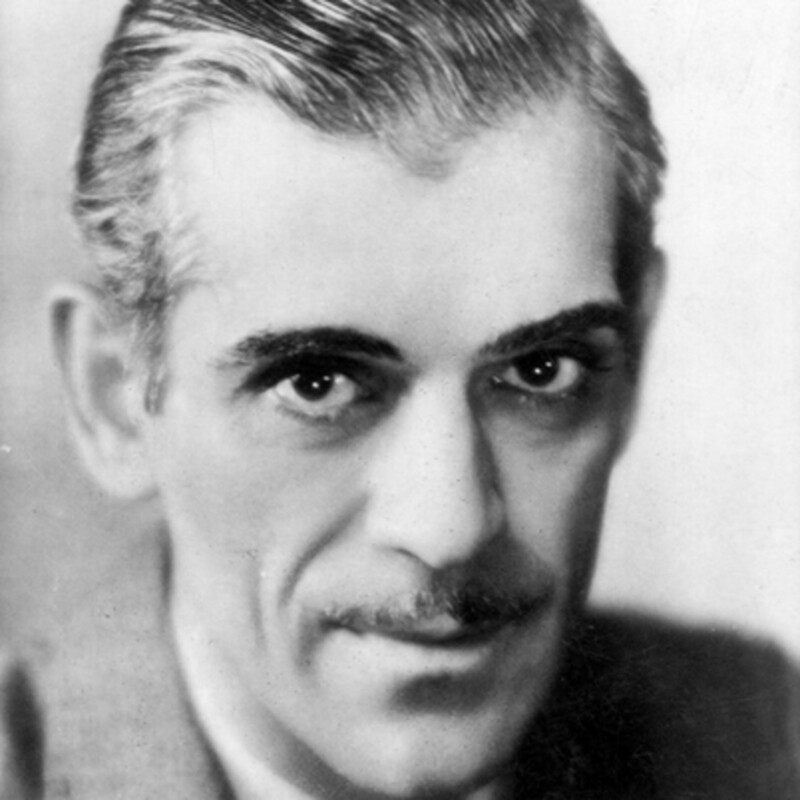 During the WWI-Era, Karloff worked in various theatrical stock companies across the U.S. to hone his acting skills. By early 1918 he was working with the Maud Amber Players in Vallejo, California, but because of the Spanish Flu outbreak in the San Francisco area and the fear of infection, the troupe was disbanded. He was able to find work with the Haggerty Repertory for a while. According to Karloff, in his first film he appeared as an extra in a crowd scene for a Frank Borzage picture at Universal for which he received $5; the title of this film has never been traced. Once Karloff arrived in Hollywood, he made dozens of silent films, but work was sporadic, and he still had to take up manual labor such as digging ditches or delivering construction plaster to earn a living. A number of his early major roles were in film serials, such as The Masked Rider (1919), in Chapter 2 of which he can be glimpsed onscreen for the first time, The Hope Diamond Mystery (1920) and King of the Wild (1930). In these early roles, he was often cast as an exotic Arabian or Indian villain. A key film which brought Karloff recognition was The Criminal Code (1931), a prison drama in which he reprised a dramatic part he had played on stage. In the autumn of 1931 Karloff played a key supporting part as an unethical newspaper reporter in Five Star Final, a film about tabloid journalism which was nominated for the Academy Award for Best Picture. He then had a small role as a mob boss in Howard Hawks’ gangster film Scarface, which was not released until 1932 because of censorship issues. The big break was on the way. Karloff’s role as what was billed as Frankenstein’s “monster” in the movie, Frankenstein, immortalized him, and the image he created for the movie is now the iconic one people think of when they think of Frankenstein. 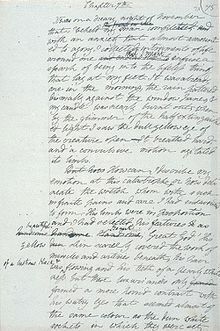 In Mary Shelley’s book, Victor Frankenstein’s creation has no name, and is referred to using all kinds of words — “creature”, “fiend”, “spectre”, “the demon”, “wretch”, “devil”, “thing”, “being”, and “ogre” – but never “monster”. The bulky costume with four-inch platform boots made it an arduous role but the costume and extensive makeup produced the classic image. The costume was a job in itself for Karloff with the shoes weighing 11 pounds (5.0 kg) each. Universal Studios was quick to acquire ownership of the copyright to the makeup format for the monster that Jack P. Pierce had designed. Karloff was soon cast as Imhotep who is revived in The Mummy, a mute butler in The Old Dark House (with Charles Laughton) and the starring role in The Mask of Fu Manchu, which were all released in 1932. These films confirmed Karloff’s new-found stardom. Karloff still played a roles in other genres besides horror, such as a religious First World War soldier in the John Ford epic The Lost Patrol (1934). Horror, however, had now become Karloff’s primary genre, and he gave a string of lauded performances in Universal’s horror films, including several with Bela Lugosi, his main rival as heir to Lon Chaney’s status as the leading horror film star. While the long-standing, creative partnership between Karloff and Lugosi never led to a close friendship, it produced some of the actors’ most revered and enduring productions, beginning with The Black Cat (1934) and continuing with Gift of Gab (1934), The Raven (1935), The Invisible Ray (1936). 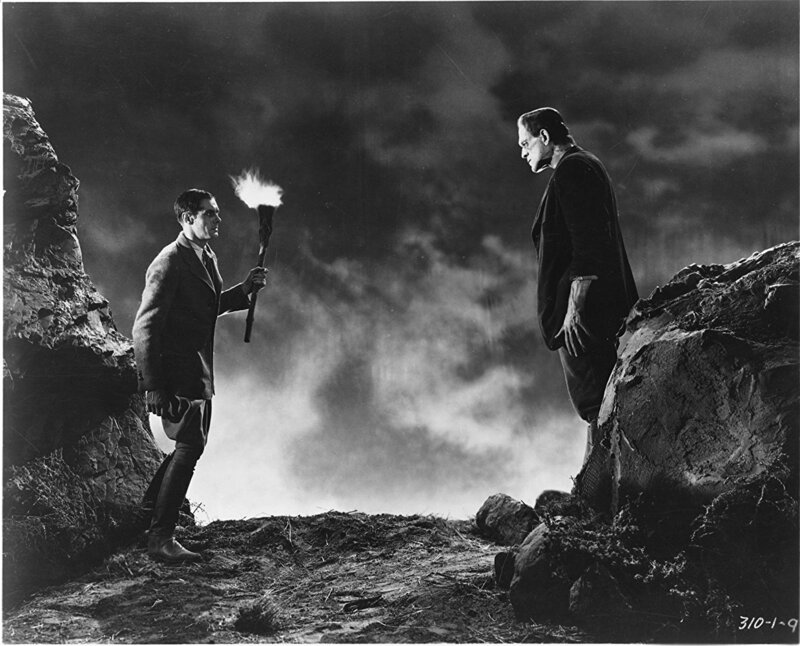 Karloff reprised the role of Frankenstein’s monster in two further films, Bride of Frankenstein (1935) and Son of Frankenstein (1939), the latter also featuring Lugosi, with Basil Rathbone replacing Colin Clive as the scientist playing god. Karloff returned to the Broadway stage in the original production of Arsenic and Old Lace in 1941, in which he played a homicidal gangster enraged to be frequently mistaken for Karloff because of a botched job done by his personal plastic surgeon. This is one of my favorite plays of all time, and I wish Karloff had starred in the movie that was made of it in 1941. The movie is more or less faithful to the play, but it stars Raymond Massey as the gangster Brewster brother because Karloff was still appearing in the role on Broadway. A great shame. 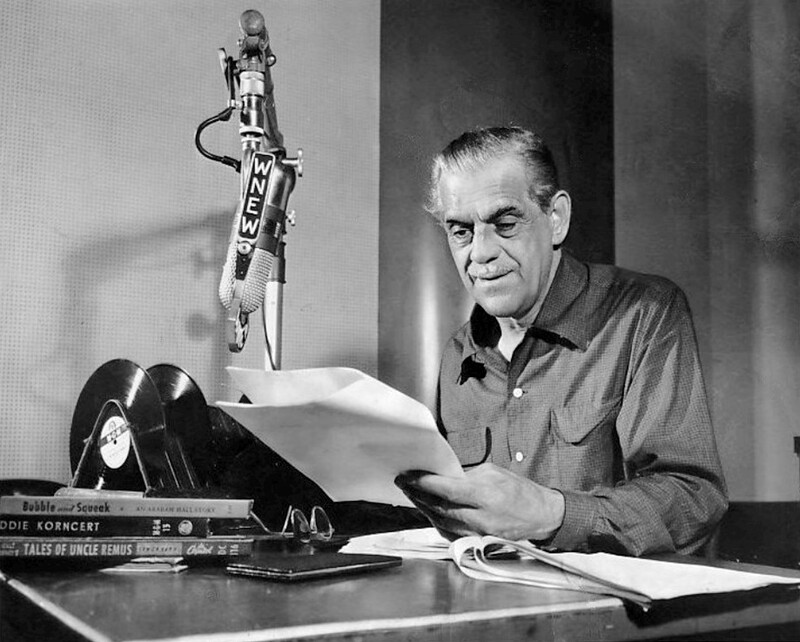 During the 1940s, Karloff was also a frequent guest on radio programs, whether it was starring in Arch Oboler’s Chicago-based Lights Out productions (including the episode “Cat Wife”) or spoofing his horror image with Fred Allen or Jack Benny. In 1949, he was the host and star of Starring Boris Karloff, a radio and television anthology series for the ABC broadcasting network. During the 1950s, he appeared on British television in the series Colonel March of Scotland Yard, in which he portrayed John Dickson Carr’s fictional detective Colonel March, who was known for solving apparently impossible crimes. He also had his own weekly children’s radio show on WNEW, New York, in 1950. He played children’s music and told stories and riddles. While the program was meant for children, Karloff attracted many adult listeners as well. Karloff continued to trade on the “mad scientist” and science fiction monster/villain for much of the rest of his dramatic career. 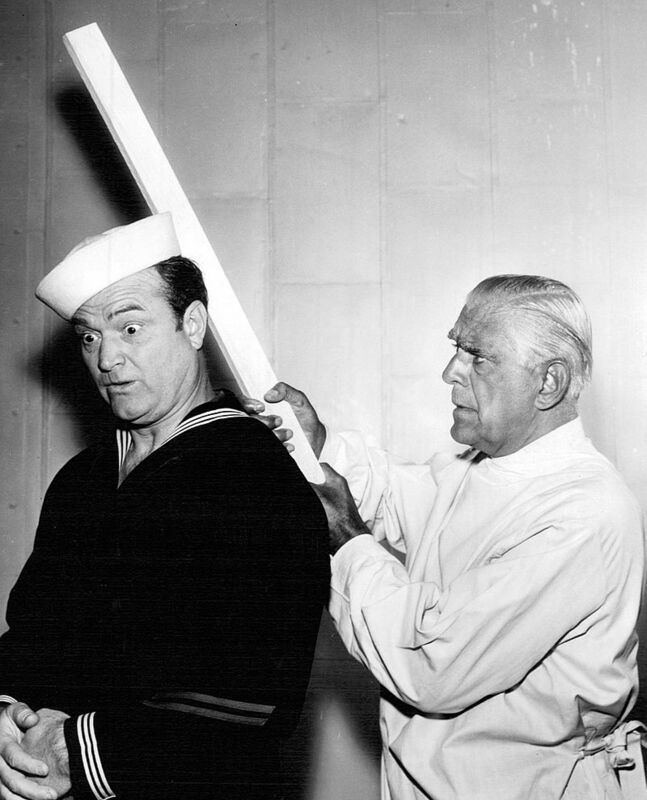 He played a foreign scientist who hoped to gain defense secrets from Cookie the Sailor (Skelton) on The Red Skelton Show in 1954. Later he shot episodes for The Red Skelton Show, starring along with horror actor Vincent Price in a parody of Frankenstein, with Red Skelton as “Klem Kadiddle Monster,” and introductions for The Veil (1958) but these was never actually broadcast, and only came to light in the 1990s. 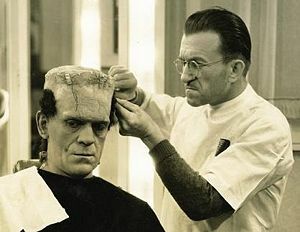 Karloff put on the monster make-up for the last time in 1962 for a Halloween episode of the TV series Route 66, which also featured Peter Lorre and Lon Chaney, Jr. 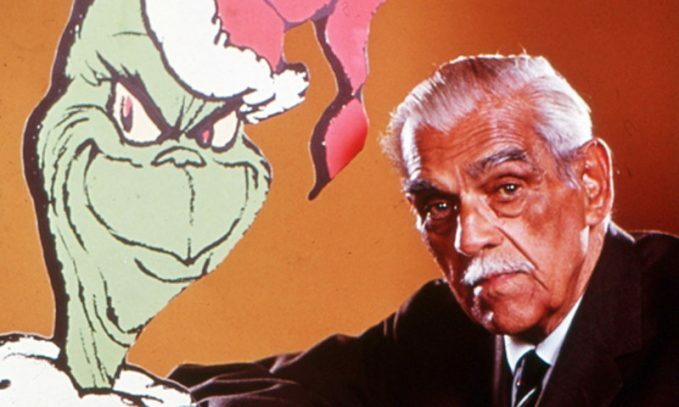 In the mid-1960s, he gained a late-career surge in popularity when he narrated the made-for-television animated film of Dr. Seuss’ How the Grinch Stole Christmas, and also provided the voice of the Grinch, although the song “You’re a Mean One, Mr. Grinch” was sung by voice actor Thurl Ravenscroft. The film was first broadcast on CBS-TV in 1966. Karloff spent his final years in England at his country cottage named Roundabout in the Hampshire village of Bramshott. He contracted bronchitis in 1968 and was hospitalized at University College Hospital. He died of pneumonia at the King Edward VII Hospital, Midhurst, in Sussex, on 2 February 1969, at the age of 81. 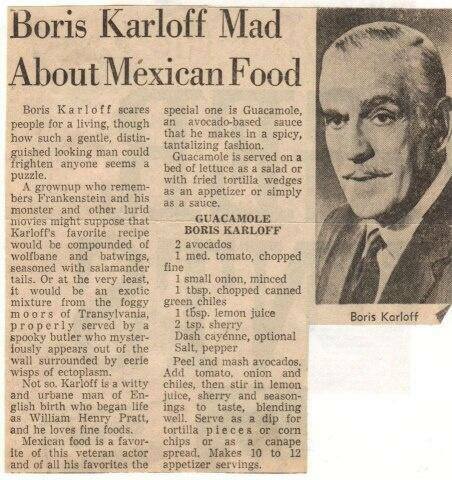 In the newspaper article pictured above (click to enlarge) Karloff admits his love of Mexican food. He probably meant what passes for Mexican food in the US. At the tail end of his career he made four low budget Mexican horror films: The Snake People, The Incredible Invasion, Fear Chamber, and House of Evil. This was a package deal with Mexican producer Luis Enrique Vergara. Karloff’s scenes were directed by Jack Hill and shot back-to-back in Los Angeles in the spring of 1968. The films were then completed in Mexico. His experience of “Mexican” cuisine was probably, therefore, of the Los Angeles variety. His guacamole recipe given there I’ll label as “interesting.” The addition of sherry appears to be the main departure from the norm (as well as the absence of cilantro). Give it a whirl if you like. Sweet versus dry sherry would make a difference; I’d opt for dry. Here’s a transcription. My advice to add to the instructions is to remove and discard the seeds from the tomato before chopping, and to mash the avocado with a fork leaving it with a little texture rather than making it into a fine puree. Also add the lemon juice before mashing to prevent the avocado from browning. Peel and mash avocados. Add onion, tomato and chiles, then stir in lemon juice, sherry and seasonings to taste, blending well. Serve as a dip for tortilla pieces or corn chips or as a canape spread. Makes 10 to 12 appetizer servings. 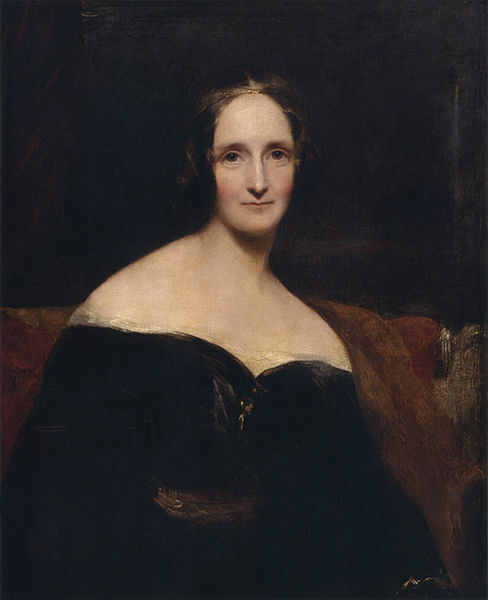 Today is the birthday (1797) of Mary Shelley (née Mary Wollstonecraft Godwin),English novelist, short story writer, dramatist, essayist, biographer, and travel writer, best known for her Gothic novel Frankenstein: or, The Modern Prometheus (1818). She also edited and promoted the works of her husband, the Romantic poet and philosopher Percy Bysshe Shelley. Her father was the political philosopher William Godwin, and her mother was the philosopher and feminist Mary Wollstonecraft. She was very well known in her day as an author, but nowadays she tends to be be reduced to the role of creator of Frankenstein and Shelley’s wife. It’s time to correct that misperception. 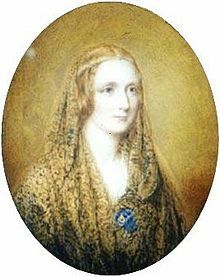 In 1814, Mary (aged 17) began a romantic relationship with Shelley who was one of her father’s political followers (and married at the time). Together with Mary’s stepsister, Claire Clairmont, they left for France and travelled through Europe. Upon their return to England, Mary was pregnant with Percy’s child. Over the next two years, she and Percy faced ostracism, constant debt, and the death of their prematurely born daughter. They married in late 1816 after the suicide of Shelley’s first wife, Harriet. The Shelleys left Britain again in 1818 for Italy, where their second and third children died before Mary Shelley gave birth to her last, and only surviving child, Percy Florence. In 1822, Percy drowned when his sailing boat sank during a storm in the Bay of La Spezia. A year later, Mary returned to England and from then on devoted herself to the upbringing of her son and a career as a professional author. The last decade of her life was dogged by illness, probably caused by the brain tumor that was to kill her at the age of 53. I am inclined to believe that in the main people nowadays do not know Mary Shelley AT ALL; not even from Frankenstein, because I don’t believe the vast majority ever read the book. All people know are Halloween images, and usually, and mistakenly, refer to “the creature” as Frankenstein. Thankfully in recent years there has been an increasing interest in her literary output, particularly in her novels, which include the historical novels Valperga (1823) and Perkin Warbeck (1830), the apocalyptic novel The Last Man (1826), and her final two novels, Lodore (1835) and Falkner (1837). Studies of her lesser-known works such as the travel book Rambles in Germany and Italy (1844) and the biographical articles for Dionysius Lardner’s Cabinet Cyclopaedia (1829–46) support the growing view that Mary Shelley remained a political radical throughout her life. Her works often take the point of view that cooperation and sympathy, particularly as practiced by women in the family, were the ways to reform civil society. This view was a direct challenge to the individualistic Romantic ethos promoted by Percy Shelley and the Enlightenment political theories articulated by her father, William Godwin. It’s an impossible task to review her entire philosophy, but even scratching the surface of Frankenstein gets at much of it. My main advice is – if you have not read it yet: READ IT. The core tale of a scientist animating a creature made of spare parts is just the beginning. Frankenstein is a deep reflection on the nature of humanity (as were all the founding novels of what became the genre of Gothic literature). Of central importance is the fact that the creature is gigantic and hideous, due not to the fact that he is made out of spare parts, but because Frankenstein does not have the skill to fashion anything more pleasing to look at. 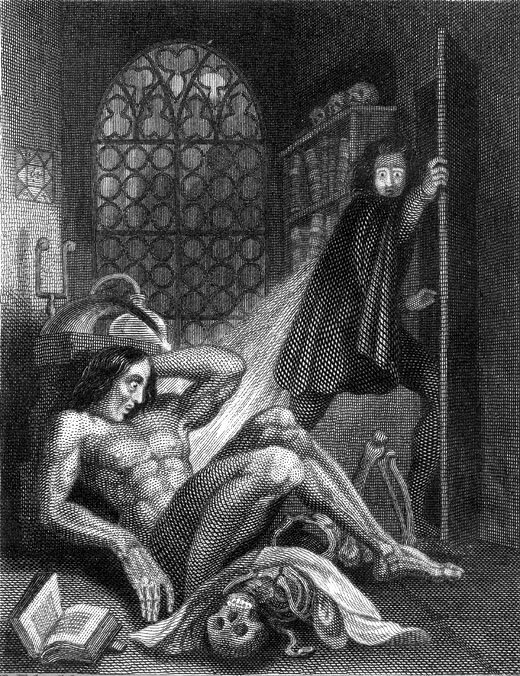 Many of the working parts, such as veins, are exposed, and the creature is huge because Frankenstein is unable to work on a smaller scale. His immediate rejection of the creature because of its gruesome appearance is the crux of the matter. What does a child/creature do when his own father/creator rejects him? In Mary Shelley’s pre-Freudian world the answer is remarkably Freudian. The creature is driven to try to please his creator, while simultaneously harboring profound anger towards him. In popular culture the angry monster piece is abundantly represented, but not the other side of the picture. After his initial rejection by Frankenstein, the creature lives on the edges of society learning first to speak and then to read. He becomes both articulate and well read. He constantly seeks approval from others, but is constantly rejected purely for his appearance. In response he becomes murderous. In many ways Frankenstein foreshadows themes in Mary Shelley’s later works, notably the roles of men and women in society and the family. In a sense the creature is a product of the male-only world. He is intelligent and thoughtful, but prone to rage and destruction. He is an outgrowth of the Romantic era’s notion of the heroic individual battling the world which Shelley implicitly condemns. The Romantic hero must ultimately fail. 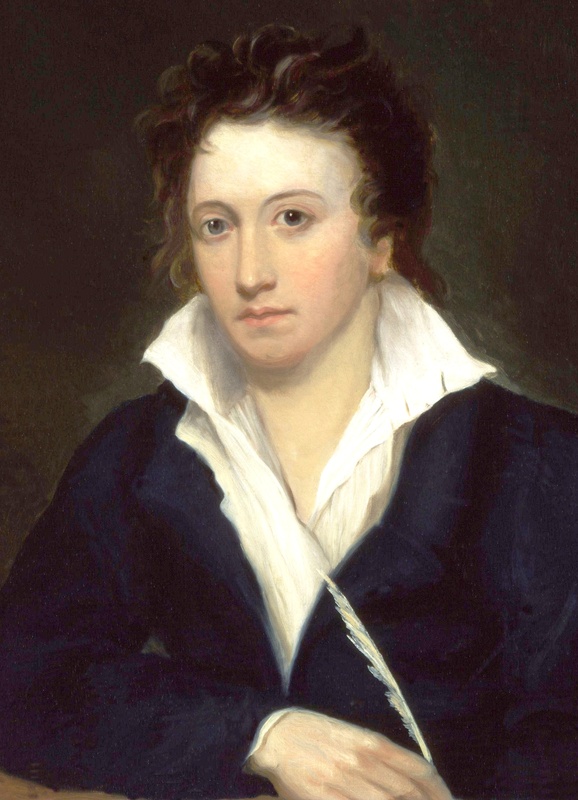 In her later novels, including Lodore and Falkner, Shelley attempts to show, a little too didactically, that love, compassion, and family can be redemptive for men, and are more powerful than individual struggle. What would the creature have been like if created by a woman? Answer: a woman would not have created him! Many classic omnibus cookbooks have a section on leftovers, what Mrs Beeton calls the “art of using up.” In a sense Frankenstein’s creature was made out of leftovers, so this seems the perfect time to have a recipe made from spare parts. I’ve lived alone for several years but can’t seem to get into the swing of making a meal for one. How do you make ONE bowl of lentil soup? Besides I like big pots of soup or stew that simmer gently for hours and fill my apartment with delicious aromas. My freezer’s pretty full most of the time with remnants, but my refrigerator is also usually stuffed with leftover ingredients. So this is more about using up what you have lying around than about leftovers per se. I have the general belief that you can stick just about anything that is hanging around in the refrigerator in stock and make a good soup. I always have stock on hand. Over 25 years ago I was low on supplies, and in scrounging around I found some bacon, tomatoes, celery, and onions. So I simply chopped them all into dice, simmered them in chicken stock and my version of refrigerator soup was born. My wife liked it so much that it became a standard as a quick lunch. I’d still be making it were it not for the fact that it is very hard to find bacon in Argentina, and, even if you do, it’s not really right for this soup. You need ordinary old U.S. supermarket bacon; what Brits call streaky bacon. Here’s a standard recipe for those who can’t work it out from my description. Quantities are not really important, but having all the ingredients is. There’s something about the combination that is magical. 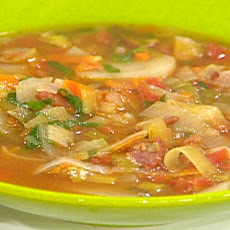 The soup has a particular freshness because the ingredients are not browned. Place all the ingredients in a saucepan and bring to a steady simmer. Cook for 20 to 25 minutes. I like the celery to retain a little crunch, but there is no harm in cooking the soup a little longer.